Laugh With the Moon by Shana Burg. Delacorte, 2012. Currently available. Face Value: I like this cover a lot. Even though it is definitely PINK, I find the silhouetted characters and landscape to be very striking. It caught my eye in a bookstore and led me to place a hold on a copy at the library before I even knew what the book was about. Does it break the slate? I’ve been hemming and hawing about this as I describe the book to fellow readers. Yes, Clare is an outstanding female character who undergoes significant growth as the story progresses. But the continuous emotional roller coaster of the plot and the “white girl discovers the world” theme negate its value as a potentially Slatebreaking book. Who would we give it to? Readers who are interested in learning about global cultures may find this interesting. It would be appropriate supplemental reading for students who are learning about Malawi in geography or social studies classes. However, I would encourage the educator to closely read and analyze this book beforehand and to decide whether or not the sentimentality and portrayal of Malawian culture is something you are comfortable including in your classroom reading. It’s always good to do some research before you introduce a work of fiction as a means of exploring another culture. Review: There is a fine line between a sweetly realistic story and a syrupy sentimental tale, and Laugh With the Moon walks that line like a clumsy gymnast on the balance beam. I picked up this book because not only was its cover attractive, but I also had seen it on some of the mock Newbery lists I follow throughout the kidlit blogosphere. Laugh With the Moon is deserving of some buzz because of the excellent characters Burg has crafted, but the plot left me cold. Laugh with the Moon follows thirteen-year-old Clare and their father when they temporarily move to Malawi following the death of Clare’s mother. Clare is still reeling from grief, and she cannot understand why her father decided to pursue medical service in Malawi. Her father had served in the Peace Corps there, and he finds joy in returning to the community he grew to love. Clare, however, is experiencing culture shock and resists adjusting to her new circumstances. Clare has to go to primary school in Malawi during their stay, so she attends a primary school with all Malawi children and befriends Memory and her younger brother Innocent. Memory and Innocent have also lost loved ones, and Clare clings to the hope that their shared experience will bring them together. Clare and Memory are both outstanding girl characters. They are thoughtful, smart, and they take charge when needed. However, Burg placed these characters in situations that bothered me as a reader. Clare is the only white student at the Malawi primary school, and the head of the school selects her to teach English and direct a play for the younger children. Even though Clare has very little confidence in herself as a teacher, she takes on the role and the younger children absolutely adore her. I was annoyed by how quickly Clare won over her Malawi classmates and neighbors. I understand from reading the author’s notes that Burg has had experience interacting with Malawi culture, so perhaps this is an accurate reflection of their response to visitors, but I felt that the whole subplot ventured into the “white savior” realm. Clare is the sweet young white girl who brings joy to all she meets while travelling abroad. The Malawians even give her the nickname “Glorious Blessing,” which is a far cry from the English names of the other students in her class – including one named Handlebar. So, just as things start improving, guess what happens? Some really bad stuff. As soon as Clare starts moving forward in her grieving process, something devastating happens that sets her back internally and socially. The traumatic event that marks a change in the story was not unexpected, but I did feel emotionally manipulated as a reader. Burg works with the scenario to introduce important concepts of cultural and class difference, and I appreciated the complexity that brought to the plot. But it didn’t rescue the storyline for me. I was still frustrated that these characters who already had to process grief and shock had to experience more trauma in order to move forward. As I pondered my reading experience with Laugh With the Moon, I thought about another deeply emotional book that I read recently that may also be considered overly sentimental. I know that some readers have stated that One for the Murphys was just too much of an emotional rollercoaster for it to be believable. Yet, somehow, that book really worked for me while Laugh With the Moon didn’t quite get to my emotional core. And I’m really craving a book like that right now. So please chime in, dear readers: What emotional books give you that kick-in-the-gut, I-need-a-box-of-Kleenex feeling? 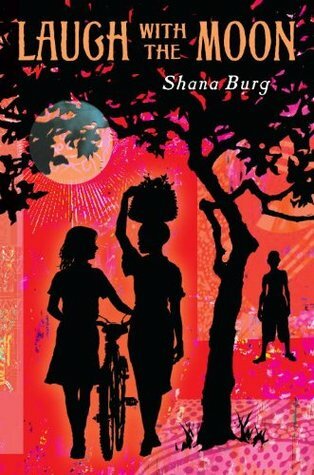 This entry was posted in Middle Grade, Reviews and tagged Africa, Death, Grief, Loss, Malawi, travel. Bookmark the permalink. The Fault in Our Stars definitely made me weepy – thanks Slatebreakers!